With wide-ranging information for academic staff, researchers and librarians, the BUFVC magazine Viewfinder explores the production, study and use of film, television and related media for higher education and research in up-to-the-minute feature articles and other news and comment. Published four times a year in March, June, October and December. The Learning on Screen issue: an update on our rebrand, the EUscreen project and active learning. Science on Screen, Flipped Learning, David Lean and the recent BFI release Visions of Change. BBC Remarc, Ousmane Sembene and British Pathé TV. The Shakespeare on Screen Issue: BBC and BUFVC Shakespeare, Spaghetti Westerns and the BUFVC library opens its doors. The Film Issue: looks at Gothic Horror, Italian Moviegoers and Sixties British Cinema; plus The Prisons Memory Archive and the ADAPT TV project. We celebrate the 100th issue of Viewfinder with a look back its long history along as well as all the latest news, reviews and features. Viewfinder 99 includes articles on MOOCs, Science fiction and science fact, digital preservation and surviving PHDs. Viewfinder 98 includes articles on Globe Theatre online, using storytelling in video learning, the Women’s Liberation Movement. Viewfinder 97 includes articles on the return of 3-D, Expanding archival access into the community, Virtual Archeology, and much more. Viewfinder 96 includes articles on new copyright exceptions, women’s contrubutions to British film & TV, the Anti-Apartheid Archives, and the ‘Earth in Vision’ project. Viewfinder 95 includes articles on the British Library Newsroon, community filmmaking, the Presto4U project, 4K digital in education, forgotten regional TV drama and much more. 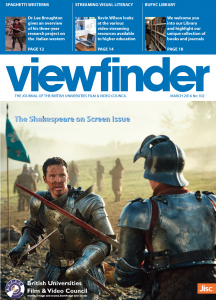 Viewfinder 93 includes articles on Jacobean drama, the Holocaust, European cinema on-demand, Black and Asian Shakespeare, the expanded BoB National service and much more. 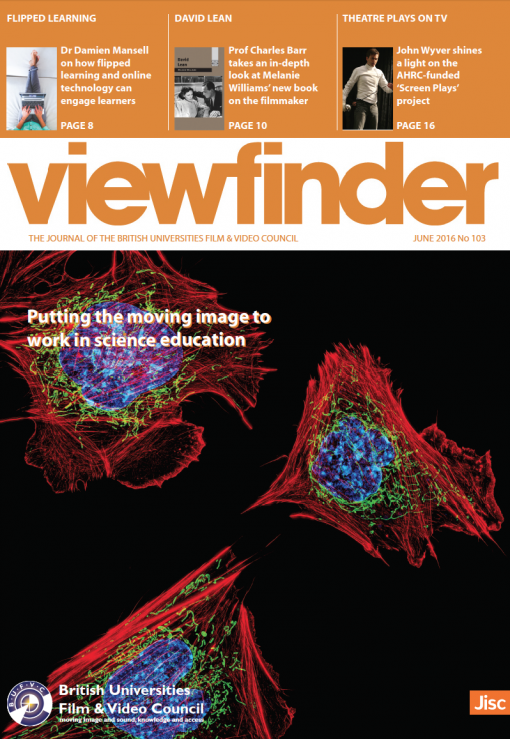 Viewfinder 92 includes articles on science videos, the REFRAME project, Channel 4 press packs, the British Library’s speech-to-text activities and much more. Viewfinder 91 includes articles on AV citation, 1960s British cinema-going, the Roundabout cinemagazine, Dziga Vertov’s early Soviet newsreels and the BBC World service. Viewfinder 90 includes articles on British cinema colour, Mental Health TV, Kafka’s Metamorphosis, music, podcasting and more. Viewfinder 89 includes articles on marketing education, Open Resources, Universal Shakespeare, 30 years of Channel 4 and more. Viewfinder 88 is now out and includes profiles of Alfred Hitchcock, the COI collections, animation, broadcast heritage in Wales and more. 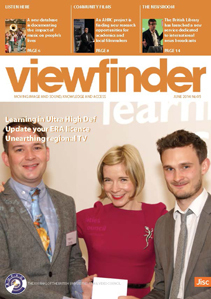 Viewfinder 87 is now out and includes profiles of the BBFC, BBC Northern Ireland TV news and EU Screen’s latest developments. 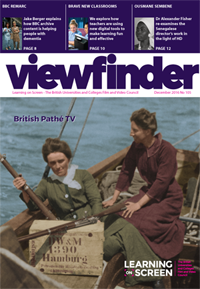 Viewfinder 86 is now out and includes profiles of Sylvia Pankhurst, the radio archives of the British Library and a project to catalogue all stage plays ever shown on UK television. Viewfinder 85 is now out and includes profiles of Film, Televiion and Audio archives in Britain and Europe, educational podcasting and Film On Four. Viewfinder 84 was published in October and profiles Digital Theatre Plus and research in to history on TV and municipal filmmaking. Viewfinder 83 was published in June and profiles 10 years of the IWM Student Film Festival, the Women’s Film History Network and the TA2 project. 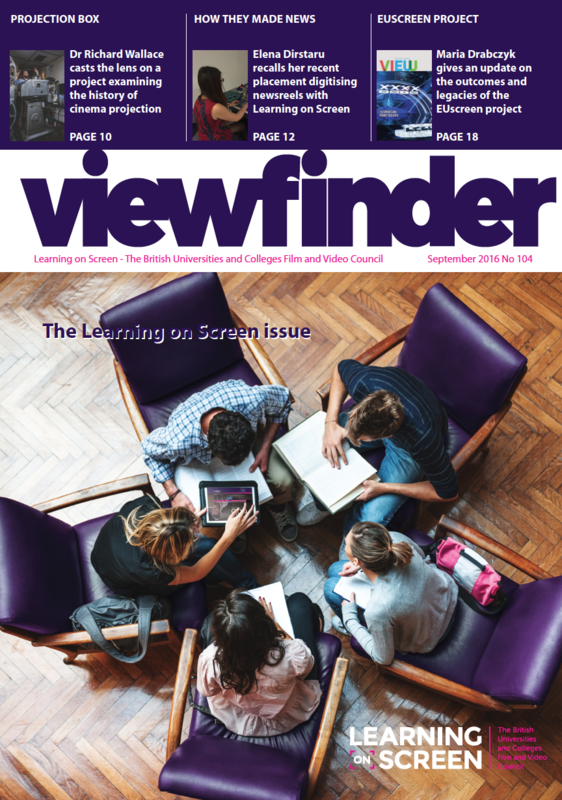 Viewfinder 82 was published in March 2011 and includes profiles of the latest DVD & Blu-ray releases, the Cardiff SciSCREEN programme and the development of JISC Digital Media. Viewfinder 81 was published in December 2010 and includes details of Power of the VHS II and the 2011 Learning On Screen Conference & Awards. Viewfinder 80 was published in September 2010 and includes a profile of Murray Weston, BUFVC’s outgoing Chief Executive. Viewfinder 79 was published in May 2010 and includes the supplement Media Online Focus (download MOF issue 40 in PDF format here). Viewfinder 78 was published in March 2010 and includes the supplement Media Online Focus (download MOF issue 39 in PDF format here). Viewfinder 77 was published in December 2009 and includes the supplement Media Online Focus (download MOF issue 38 in PDF format here). Viewfinder 76 was published in October 2009 and includes the supplement Media Online Focus (download MOF issue 37 in PDF format here). Viewfinder 75 was published in June 2009 and includes the supplement Media Online Focus (download MOF issue 36 in PDF format here).